Welcome to the the home of the Fairfield County Football League (FCFL). 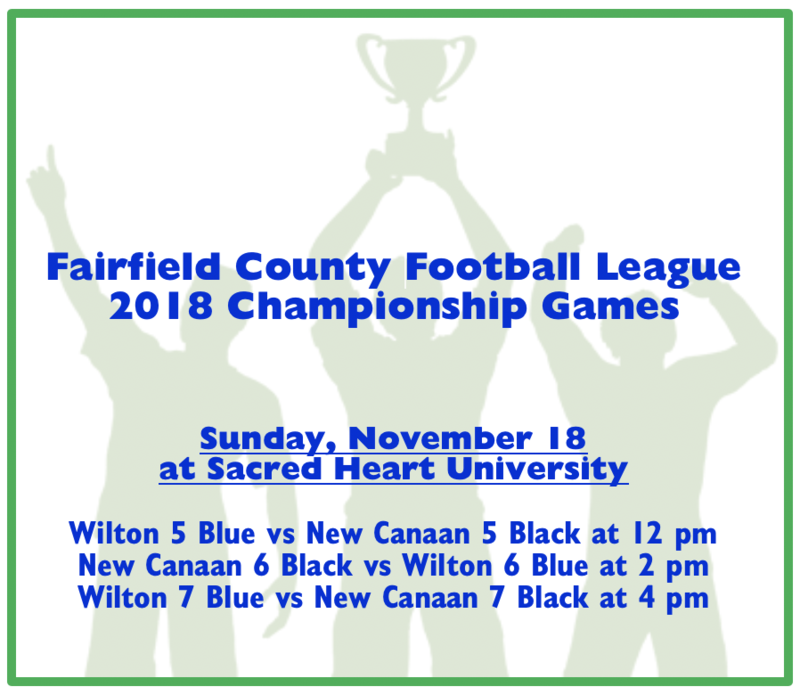 The FCFL is a youth football league comprised of 8 Member Organizations (Darien, Fairfield, New Canaan, Norwalk, Ridgefield, Westport and Wilton). Each Member Organization has three (3) representatives who sit on the FCFL Board of Directors. The role of the Representative is to bring forward for consideration the requests of the Member Organization they represent as well as to oversee the governance of the league. The FCFL was formed from the Gateway Football League in 2001. The founding Member Organizations were Darien, New Canaan, Westport and Wilton. Fairfield joined the FCFL in 2005 as our Fifth Member Organization. In 2010 we welcomed The Ridgefield Raiders Youth Football Program into our League and recently the Norwalk Youth Football league joined us in 2019. The league was formed to create a football program focusing on getting as many kids playing football as possible, developing fundamental football skills in a progressive manner, requiring evenly split teams, safety, fairness and healthy competition rather than winning at all costs and building strong teams by keeping less talented players off the field. Using this formula the FCFL has grown enormously over the past years to its present size of over 2,400 kids playing on 65 tackle football teams. This model has also provided all the Towns with opportunities to experience success and Championship teams in the various grade levels over that time period. Additionally, the proximity of the towns provides the competition of a travel program without the tremendous pressure placed on families when travelling long distances is required. Our size also makes it possible for us to accommodate the scheduling needs of the towns involved. In other words, what we have created has prospered. The only way this can continue is if all the towns are still on the same page working together regarding the goals and aspirations of the FCFL to provide the unique experience football provides to as many kids as possible.
" " and " ".